A beautiful view with a little romantic lighting is all you need to get guests excited for your upcoming celebration. These all in one romantic lighting wedding invitations feature a gorgeous tree silhouette with glowing white string lights. These two-sided invitations are printed with your photo and invitation wording on the front and your choice of wording on the back (reception details shown). Matching response postcards are included in the price. Due to the unique printing process required to offer you this invitation and its coordinating pieces at a lower cost, you will personalize the invitation and response card together; however, you will receive the pieces separated. Design and wording are printed in your choice of colors and fonts. 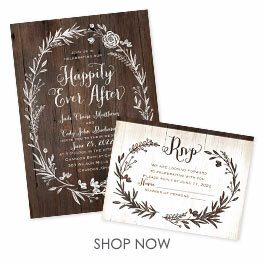 Inner and outer envelopes are included with these all in one wedding invitations. Perfect wedding invitation for your night under the stars! We really loved the invitations, the people we sent them to also thought they were great. Everyone, including ourselves particularly like the personal touch of having our photo as part of the invitation. the price was incredible I would highly recommend your company.